Just upload your regular PowerPoint or PDF presentations to Glisser, and you can share them live to audience mobile devices, slide-by-slide, as they are presented. 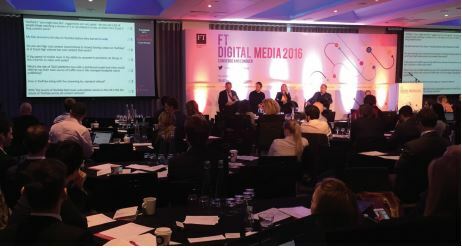 You can enable members of the audience to interact with presenters and each other, and collect valuable feedback and data. Your attendees can also electronically mark-up the slides with notes, and keep them for future reference. Glisser allows you to include live audience questions, a Twitter feed, as well as polling and feedback slides integrated seamlessly within the original presentation. Each presentation or panel session can be individually set up to enable just the features you want to use, and varying levels of security can be applied to suit your event. Presenters and event organisers can set up presentations in minutes at the glisser.com website, or with the Glisser PowerPoint Add-In, which generates a unique and customisable URL for your audience to use. Audience members can access slides and interact via the web browser on their smartphone, tablet or laptop – a solution that works across all major devices without any download required. iQ Pad is our popular mid range learner response system. The wireless handsets allow each and every student or participant in any teaching, training, or briefing situation to have the answers instantly recorded and the results analysed. Introducing the all new Pebble battery operated Interactive Response System. Pebble allows for yes/no, true/false, numeric and multiple choice answers. The key icon allows a student to lock on to an ID. The set comes with a teacher handset and receiver. The Pebble works with Class Comm Audience Response Software. abilities of the teacher to know whom has understood the lesson. Promethean and SMART Technologies have each developed solutions to the subject of classroom participation through interactive response and voting systems. Also known as a interactive voting system, audience response system, student response system or interactive learning response system. It is a system through which group participation is promoted during classroom teaching, debate, quiz or any other discussion. This system consists of one main teacher handset, and a set of student handsets (either 12, 24 or 32, dependent of set purchased), one handset receiver (which uses superior radio frequency technology) and response system software. 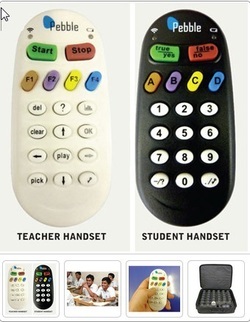 In an interactive classroom environment, the teacher carries the main handset and each student has a personal compact wireless handset. 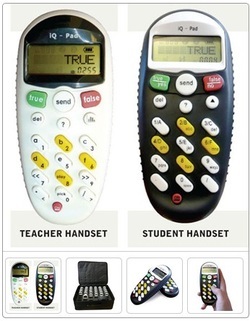 The teacher asks a question from the class and then the class replies back through their personal handsets. The response software catches the students' response through the receiver and then generates a report in the form of table, graph, pie chart etc.